The following maps have been produced by Jonathan Pearson based upon the sketch map found in the GDW Invasion Sourcebook (Page 41). This map is a coloured version of the GDW Invasion Sourcebook original. The coloured areas represent land under "cultivation". This map takes the GDW Invasion Sourcbook original and attempts to define the likely climate conditions present across the globe. I have used a simplified version of the Koppen climate clasification system. This splits climates firstly by temperature range criteria (indicated by the first letter) which are then subdivided (indicated by a second and third letter). 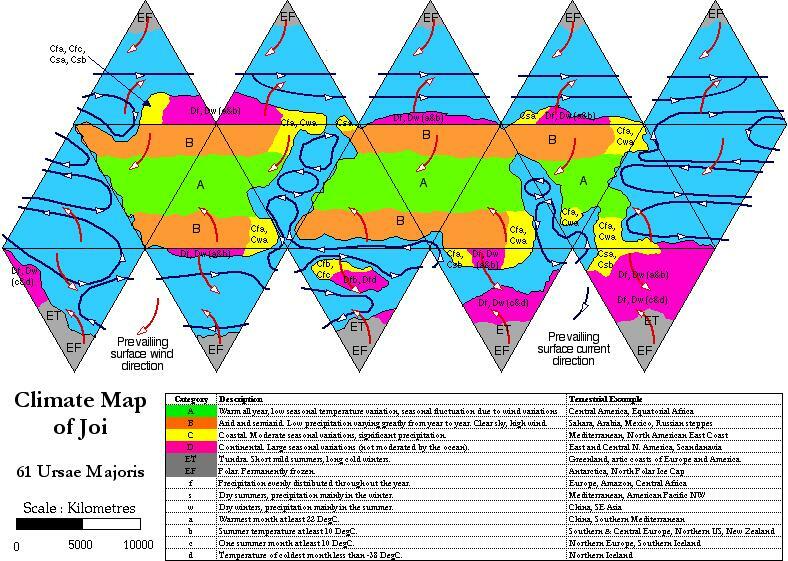 The map includes an explanatory key along with Terrestrial examples. 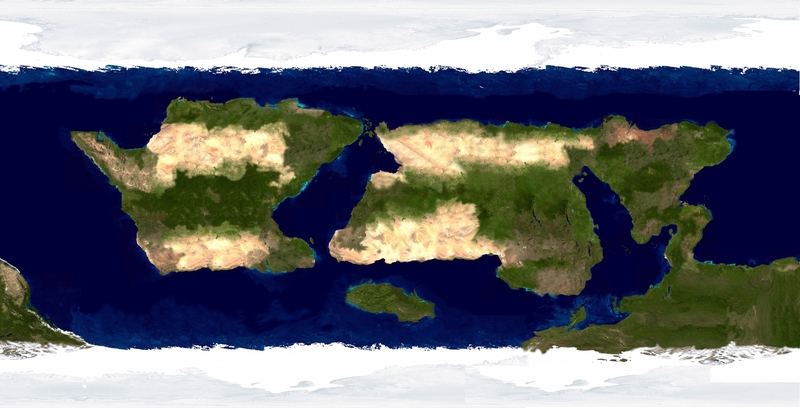 The climate types were assigned on the basis that Joi's climate is identical to that of Earth except that the landmasses are in a different position. Thus the east coast of a continent between 20 and 35 N and S will have similar climates to the SE of the USA or Argentina (Type Cfa as it happens - humid subtropical). I have included the prevailing surface wind directions (red arrows) generated by the interaction of the solar heating and the corriolis force (Hadley Cells). Also shown are the surface ocean currents (blue arrows) which I basically guessed at based on Earth's equivalents. The climate types listed are as follows. ET Tundra. Long cold winters and short mild summers although snow and frost are possible at any time of year. Northern coasts of Eurpoe and North America, Coastal regions of Greenland. The image below is a low resolution version of the map. The high resolution version can be found on the following link. 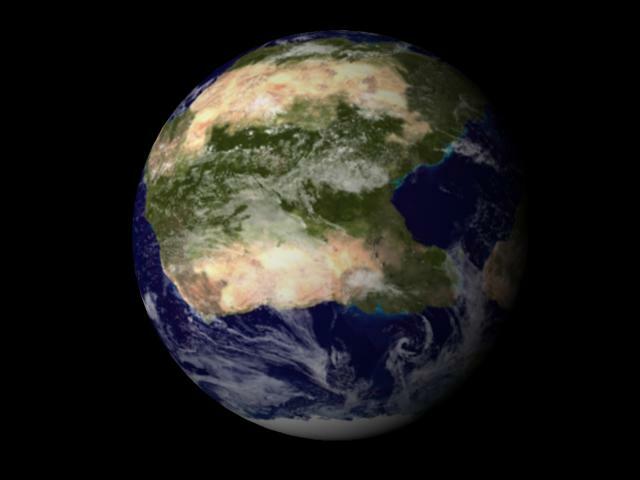 Using the GDW Invasion Sourcebook original, the above climate model and NASA's "Blue Marble" images of Earth I constructed a cylindrical projection view of Joi as seen from orbit. This can be wrapped around a sphere by most 3D programs - which is what I have done for a view of each colony and continent below. The Joienne Republic of Elysia occupies the island continent between the South Pole and the western part of the largest continent of Pays de Verde. New Cornwall lies on the west coast at the southern end of the land bridge between the eastern part of the largest continent of Pays de Verde and the South Polar continent. Lubumbashi lies inland of New Cornwall. Toshasimizu occupies the eatern tip of the second largest contient of Pays d'Esperence while Halbinsel lies on the western tip of the western part of the largest continent of Pays de Verde. Thus Toshasimizu is on the western side of the straits leading to the North Polar Sea (in the centre of the image) while Halbinsel is on the eastern side. 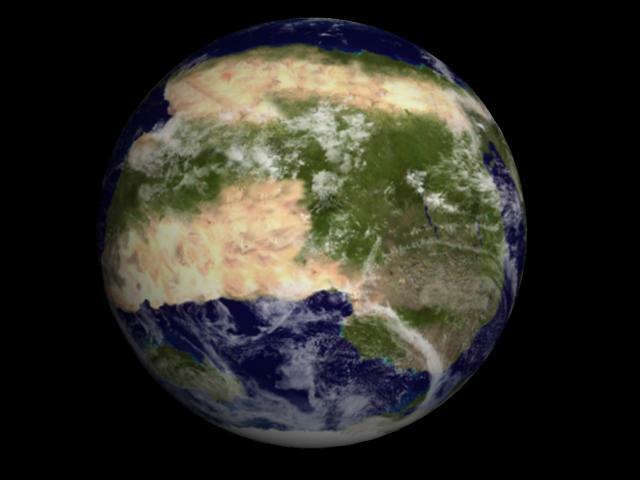 The Pays de Verde is the largest continent on Joi and is split into two parts. 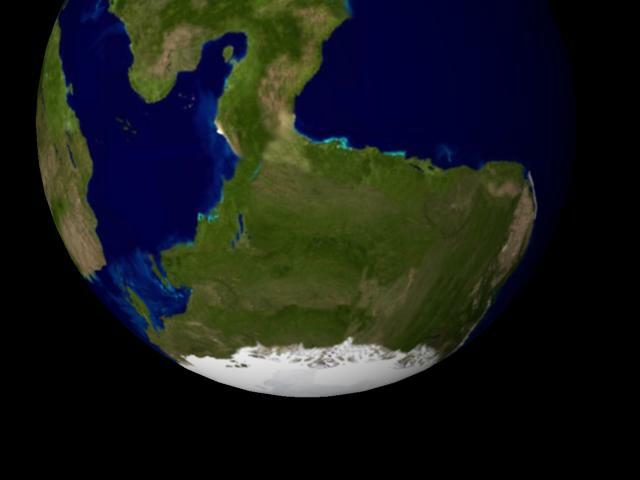 The eastern part, which makes up roughly a third of the whole, is joined to the Southern Polar Contienent by a substantial land bridge. 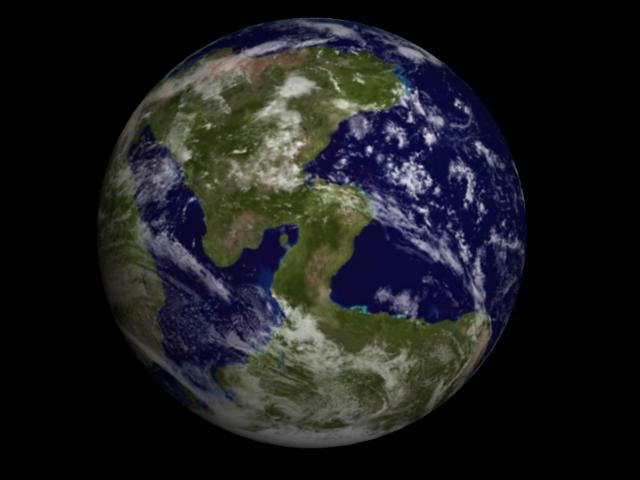 The Pays de Verde is the largest continent on Joi and is split into two parts. The western part, which makes up roughly two-thirds of the whole, is a similar size to the whole of the Pays d'Esperence (the second largest continent). Western Pays de Verde is separated from the Pays d'Esperence by the Mediterreanean Ocean which narrows significantly at both the northern and southern ends where the two continents are separated by relatively narrow straights, albeit still several hundred kilometres wide. The Pays d'Esperence is Joi's second largest contient. To the east, across the is the Mediterreanean Ocean, is the Pays de Verde while to the west is Joi's Great Ocean. 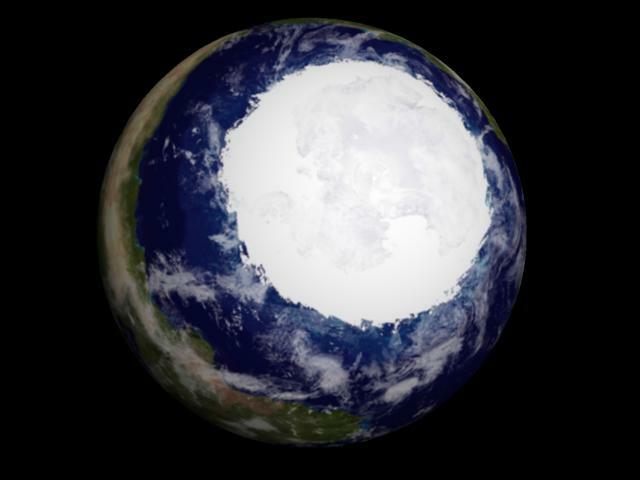 Joi's North Pole (like Earth's) is purely ice floating on the North Polar Ocean - there is no North Polar landmass. Joi's South Polar cap overlies the South Polar Continent which is itself joined to the eastern part of the Pays de Verde by a substantial land bridge. My 3D program also does animations which for those of you with broadband can be found below. 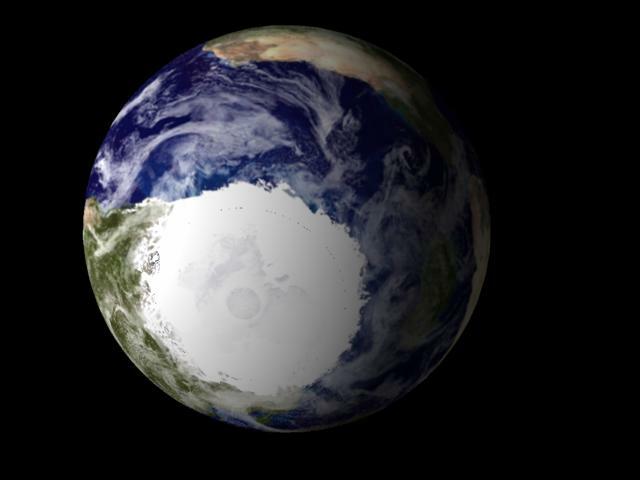 Quicktime movie of rotating globe with a cloudless sky (2.1 MB). 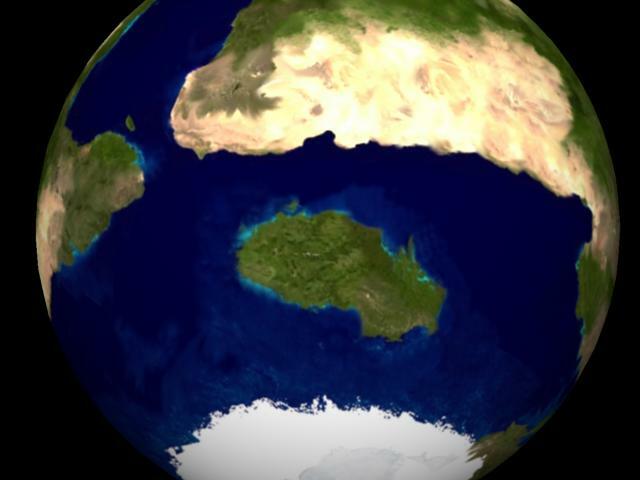 Quicktime movie of rotating globe with cloud patterns (3.3 MB). The Quicktime viewer can be downloaded from Apple. Joi is a strange world to Earthly eyes. 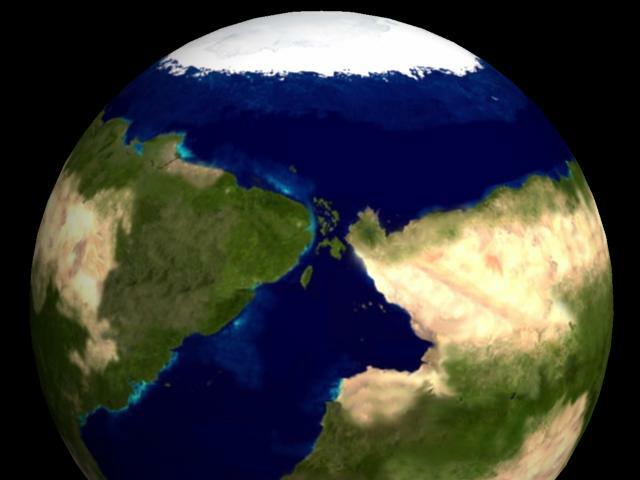 Its unusual geology (the geologically recent cessation of plate tectonics) has resulted in very flat landmasses with few mountains of any kind with the continents rising gently from the surrounding oceans to a central plateau. While the Joian landscape may be smooth on the global scale locally the processes of errosion have taken their toll. Thus rivers have carved channels, the cycling of glaciers has scraped valleys and waves and tides have have shaped the coastlines.